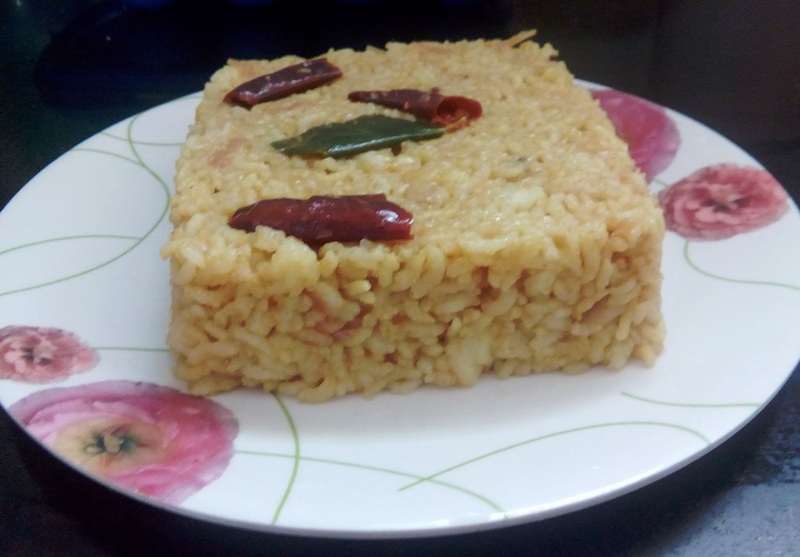 If you are going on a picnic or a long journey and are planning to take home cooked food with you, then tamarind rice would be a perfect choice. You do not have to spend much time in the kitchen as it is easy to prepare with minimal ingredients. Further Tamarind rice does not spill over and stays fresh for a really long time. You can boil eggs or fry appams/papad and your lunch basket would be ready. 3 dry red chillies cut into 2 pieces and deseeded. Take a small ball of tamarind and wash with water. Then take a pan, add 1 cup water and add the tamarind to this..
Heat the water in the pan and when it starts boiling switch off the gas. Allow this to cool down a bit and gently mash the tamarind to get the pulp. Extract the pulp and keep the tamarind pulp ready. Heat oil in a pan, add mustard seeds and allow them to sputter. Add onions, red chillies and curry leaves and sauté for a few minutes till the onions turn soft. Add salt, asafoetida and the tamarind pulp. Add water if necessary and bring to a boil. Now reduce the heat to low and add the cooked rice to this and close a lid. After a couple of minutes, open the lid and mix the rice well with other ingredients. Tamarind rice is now ready. Serve hot with appalam/ papad or any side dish of your choice.